The unedited kiss was so much better! So I thought as there are already so many pictures of the close up, I'd whip up a long shot. That's the last of Who art for a while from me I think... well probably not, but I'll try not to draw any for a while. Specially not any more of this sappy stuff but I love it so! O. My gosh. The shipping is jus... Off the charts. 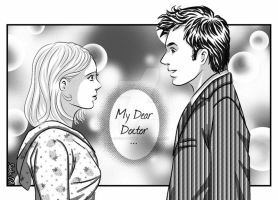 Something I've been thinking about, is that if the doctor has a machine that he can use to make himself human, why not make Rose timelord? They could be together, and when Journeys end comes along he can make the other doctor become John Smith for the poor matron. Rose+timelord+doctor=LOVE and HUMAN DOCTOR+John Smith+Matron=LOVE And LOVE+LOVE=JOY!! Wow. This is really good! This is how it should have been!! at last....since we didn't enjoy it in the series,THANK YOU! 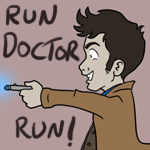 Yes, Doctor. Yes, it needs saying. I cried during that part. I love it SO much! Brilliant colours, brilliant work! I love it! That's so beautiful... The Doctor and Rose forever! That's what I say! Speaking of cute things, if you look up "David Tennant hair ruffle" on YouTube, you'll get a seven second video of exactly what it says on the tin. Being semi-monochromatic gives it such a unique feel. This is very beautiful, well done! Your anatomy is fabulous as well as the folds in the clothes, my friend. Such a great rendition of a pivotal moment in the series. The expressions are what really catch my eye! Calm yet passionate. Keep up the great work! this is an amazing drawing. I've been watching Doctor Who, since the New Series started with "Rose"... and now own some of the DVD's from the old series... To the point, Doomsday was the sadest episode I have ever seen, and "Turn Left" was the best Happiest/Saddest/Confusing... Mixed Reaction episode I had ever seen in ANY TV show, and the The Doctor copy and Rose... I Think I almost exploded!!!! Thanks so much I loved Doomsday so much; I cry every time I watch it, still! The music is amazing. Love the way you did the cloths! I like how they are offcenter. The color pallet is very nice. Very calm, soothing, sets the mood. His hair is amazing! I love his hair on the show and I like the way you did it here. Ah, those sideburns. It really looks like both of them too. All in all, a very nicely done. Kudos to you!